The set of all sets that are not members of themselves". This is a contradiction since this set must be both a member of itself, and not a member of itself. 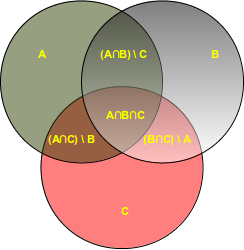 The philosopher Wittgenstein didn't like the set theory and complained mathematics is "ridden through and through with the pernicious idioms of set theory," He dismissed the set theory as "utter nonsense", as being "laughable" and "wrong". His criticism appeared years after the death of the German mathematician Georg Cantor, the founder of the set theory. "A set is a gathering together into a whole of definite, distinct objects of our perception and of our thought - which are called elements of the set." Nowadays, we can say in "plain" English: A set is a well defined collection of objects. The elements or members of a set can be anything: numbers, characters, words, names, letters of the alphabet, even other sets, and so on. Sets are usually denoted with capital letters. This is not the exact mathematical definition, but it is good enough for the following. If we want to create a set, we can call the built-in set function with a sequence or another iterable object. As we have expected, no doublets are in the resulting set of cities. A method which adds an element, which has to be immutable, to a set. Of course, an element will only be added, if it is not already contained in the set. If it is already contained, the method call has no effect. All elements will removed from a set. Creates a shallow copy, which is returned. The assignment "cities_backup = more_cities" just creates a pointer, i.e. another name, to the same data structure. This method returns the difference of two or more sets as a new set. The method difference_update removes all elements of another set from this set. x.difference_update(y) is the same as "x = x - y"
An element el will be removed from the set, if it is contained in the set. If el is not a member of the set, nothing will be done. works like discard(), but if el is not a member of the set, a KeyError will be raised. Returns the intersection of the instance set and the set s as a new set. In other words: A set with all the elements which are contained in both sets is returned. This method returns True if two sets have a null intersection. x.issubset(y) returns True, if x is a subset of y. "<=" is an abbreviation for "Subset of"	and ">=" for "superset of"
"<" is used to check if a set is a proper subset of a set. >>> x < x # a set can never be a proper subset of oneself. x.issuperset(y) returns True, if x is a superset of y. ">=" is an abbreviation for "issuperset of"
">" is used to check if a set is a proper superset of a set.